It's #SBSCon week! If you don't want to be bombarded with tweets and photos of my blogger girls and me come Friday, you should probably unfollow now - #sorrynotsorry. No, but seriously. Y'all know how much I look forward to this conference every summer and this year, I'm over-the-moon excited. It's a bittersweet feeling heading to Charleston for this celebratory time after everything that has happened in the last week. The Southern Blog Society has made a donation to the Emanuel AME Church, and I'm planning to take time during my visit to go to the church. Thank you, Charleston, for opening your arms to us. 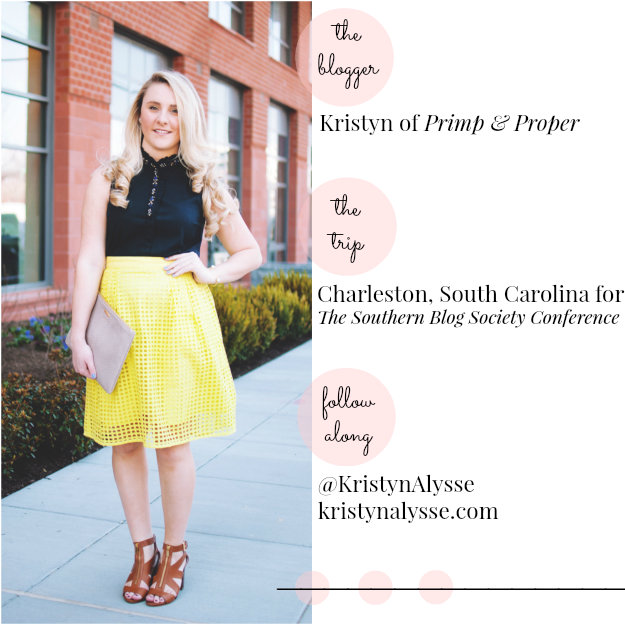 For this week's Let's Go There post, I'm featuring one of my DC girls who will be attending the conference this weekend. Kristyn and I met at a blogger meet-up a couple of years ago and have followed each other ever since. She's a Tennessee girl and I might as well be one! I hope you enjoy taking a peek inside her suitcase as we gear up for what's sure to be an epic weekend! I'm heading to Charleston this weekend for the Southern Blog Society conference! My weekend will be all about the blog. 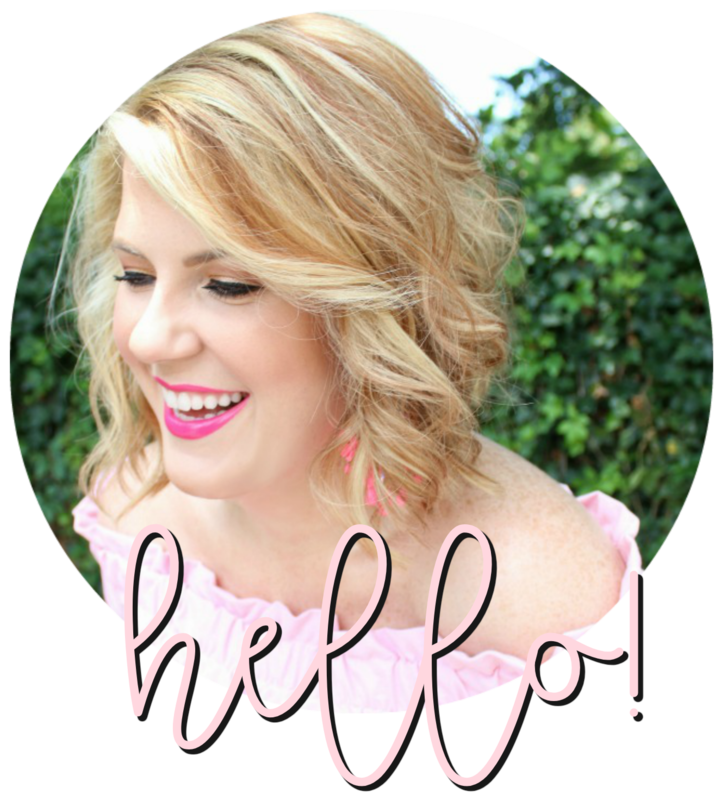 Everything from meeting fellow bloggers from all across the southeast (and southwest... they're coming too! ), connecting with brands, learning how to grow my blog, etc. There will also be some sightseeing, exploring Charleston, and of course enjoying some great seafood! When it comes to packing, I try to tackle it the same way I would with my weekly routine. With lists. I make an initial list of the type of events I'll be attending, and then add bullet points underneath for what I need to wear or bring to those events. That way I don't forget anything. I usually tend to overpack and account for the unexpected, so I try to pack one or two more outfits than I need. That way I have plenty of options. Before I head out the door to catch my flight, I usually run through the list one more time. I go over the essentials (toiletries, medicine, phone chargers, etc.) as well. This strategy has worked the best for me, and (knock on wood) helps ensure I don't leave anything behind. Some of the essentials I'm bringing with me to Charleston are: lots of tassels (can never have too many for summer, right? ), large clutches, and beauty products that'll help keep me looking fresh all day long. As for my inflight essentials, I always make sure I have a great summer read, my iPad, business cards, a great pair of sunnies for when you get off the plane, and of course a portable charger. I love this charger because it holds 4 full charges. You can also charge two phones at once!! Definitely necessary for my weekend at a blogger conference (so much social media will be happening!!!). Whenever I travel to a new city, I love to bring a little DC with me. 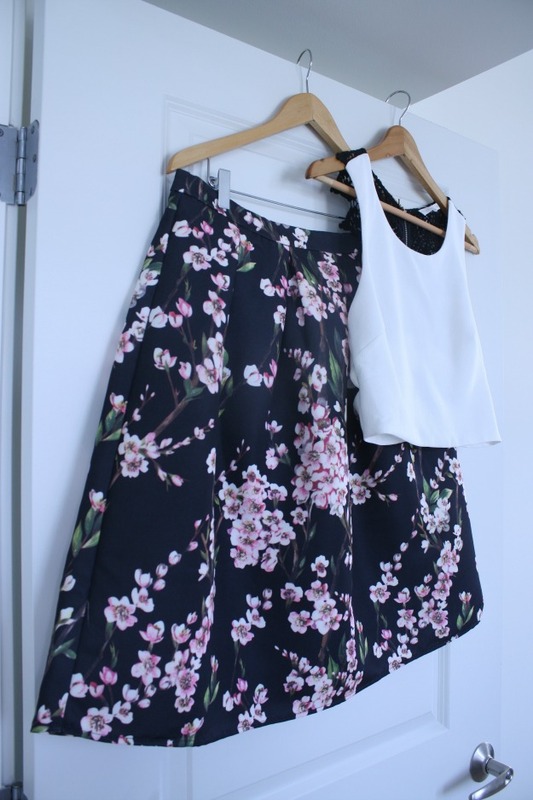 My favorite item has to be this "cherry blossom" midi-skirt. I picked it up from one of my fave boutiques here in DC, Violet Boutique. I'm pairing it with a white crop top and some black block heels. It'll be the perfect first impression outfit for our Friday night cocktail party. I always love a good statement piece that just helps spark a conversation! Thanks for the feature sweet friend!!! Cannot wait to hangout this weekend and have a blast at SBScon!!! Can't wait to see what you're packing this week too!